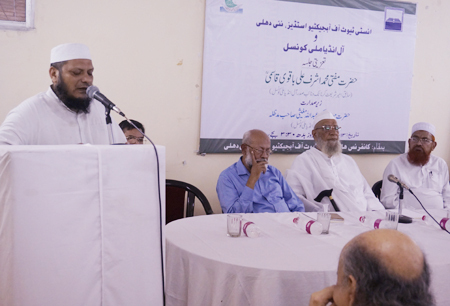 The Institute of Objective Studies and the All India Milli Council jointly organised a condolence meeting at the conference hall of the Institute on September 13, 2017 to remember Mufti Ashraf Ali Baqwi Qasmi, Amir-e-Shariat, Karnataka and Vice President, All India Milli Council, who left this mundane world on September 8, 2017. Recalling his services to the Muslim community, Maulana Abdullah Mughesi, President, AIMC, said that Mufti Baqwi embodied many qualities, including pursuit of Islamic knowledge, organising capability, a tender heart and meticulous planning. His active role in pushing the caravan of AIMC ahead had been noticeable, he observed. 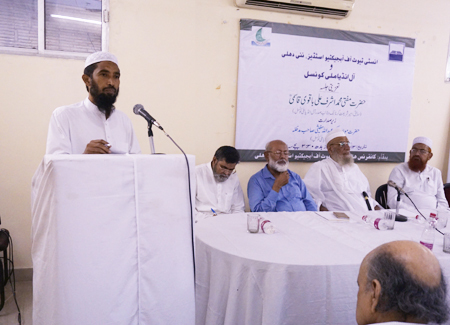 The Chairman, IOS and General Secretary, AIMC, Dr. Mohammad Manzoor Alam described him as a man of many fine traits which made him a litterateur, poet, expert in Islamic jurisprudence and Hadith. Besides being a deft organiser, he had developed a good rapport with different religions. Ministers and senior officials used to turn to him for advice. He always felt concerned to channelise youth power without the distinction of caste and creed. He said that Mufti Baqwi frequently helped people without consideration of the school of thought they belonged to. He was a force for forging unity among diverse schools of Islamic thought in Karnataka and other south Indian states. Dr. Alam pointed out that with his death, the lamp had not been extinguished, but has lighted thousands of lamps. He added that Mufti Ashraf Ali Baqwi had been actively involved in taking the movement of Milli Council forward. By patronising several sessions of the Milli Council he proved his mettle as a successful organiser. Maulana Safdar Husain Nadwi said that Mufti Baqwi had a deep knowledge of Islamic jurisprudence and Shariah. 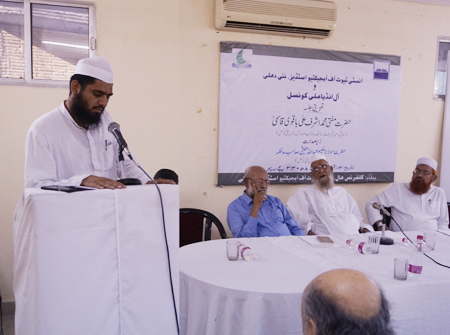 He read out the message of the eminent Islamic scholar based in Kuwait, Maulana Badrul Hasan Qasmi. In his message, Maulana Qasmi paid homage to Mufti Ashraf Ali and said that in his death the community had suffered an irreparable loss. Though he was a reticent person, his heart was burning with the desire for the well-being of the Ummah. His field of activity was not confined to south India alone as he was associated with several milli organisations and such institutions spread all over the country. Mufti Ahmad Nadir al-Qasmi observed that Mufti Baqwi was counted among top ulema who excelled in the knowledge of Hadith. He was a well-read and well- informed aalim who dedicated his life to bridging the divide between north and the south. He unceasingly endeavoured to shape the Muslim society in accordance with the Sunnah of the Prophet (PBUH). Mufti Imtiyaz Ahmad said that Maulana Baqwi was the Vice-President of Islamic Fiqh Academy and his (Imtiyaz Ahmad’s) association with him was that of a teacher and the taught. He was affectionate to his juniors and divised a good system of training. His love for learning was worthy of emulation. His popularity could be gauged from the fact that his funeral was attended by a large number of people. 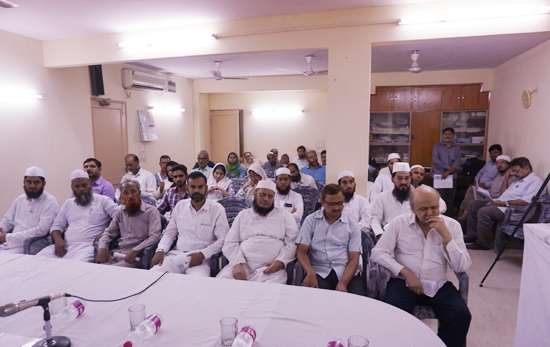 The General Secretary, Delhi Unit, Milli Council, Mirza Zaki Ahmed Beg, referred to his first meeting with Mufti Baqwi in 2006 and said that he was very much impressed with the discipline of his school. He always focused on good education and training of his students. 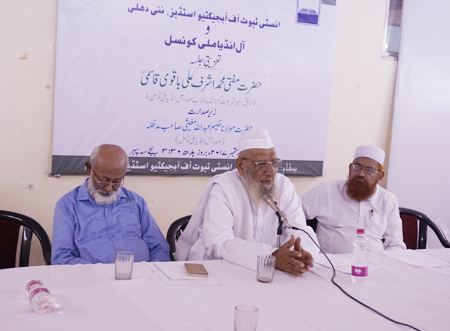 Prof. Haseena Hashia, professor of geography, JMI, observed that some people left a lasting imprint on society after their death, and Mufti Baqwi was one of them. She said that the late Qazi Mujahidul Islam Qasmi used to refer him quite often. She met him only in 2000. He always worked for reconciling differences among schools of Islamic thought, she added. 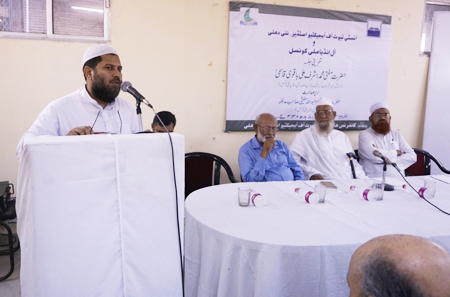 President, Milli Council, Saharanpur, Maulana Abdul Malik Mughesi held that Mufit Baqwi was a guiding light for the community. The true homage to him would be to follow in his footsteps, he said. Maulana Aliq-ur-Rahman Rashadi opined that Maulana Baqwi’s death had created a void in south India that was difficult to fill. 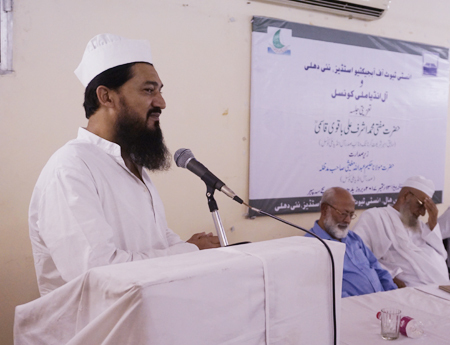 Wasim Ahmed PRO, AIMC, also paid tribute to Mufti Baqwi. 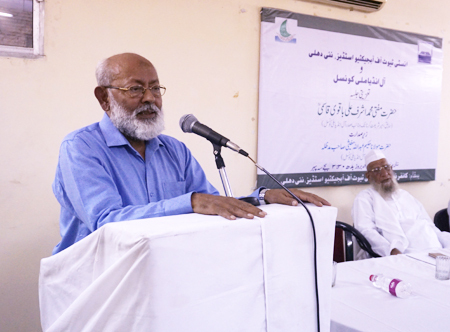 The proceedings of the condolence meeting were conducted by Dr. Nakhat Husain Nadwi. Staff of IOS, Milli Council and Islamic Fiqh Academy, besides Islamic scholars and prominent citizens attended the condolence meeting.